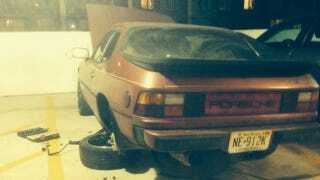 500 Dollar Special Porsche 924. I have been looking for a project car for a while now. My budget was pretty strictly 500 dollars to limit myself to the down and dirty stuff. Some of you may recall a while back I asked about one or two different cars all of which I eventually decided against. However, this little Porsche 924 fit the bill in almost all categories. Let's talk about this car's specifics. It is a 1982 ('81 manf date.) Porsche 924, with a 2.0 Liter 4 cylinder (yes the wimpy audi/VW sourced 4 cylinder. ), 5 speed manual, and is maroon-ish red. I paid all of 500 dollars for the car (including a title, who woulda thunk it.) and 75 bucks for a set of original Porsche wheels with nearly new rubber on them. The only MAJOR problem with this car, is the brakes don't work, and the problem has been narrowed down to a rusted out brake line. As you can imagine it hasn't been driven since I got it and put it in the spot (very, very cautiously) by slamming the E-brake to make it stop. The interior is pretty trashed apart from some possibly Ferarri sourced seats (I'm not 100% sure, the PO said they were out of a 512TR and I really, really doubted that, but upon further inspection I found a Ferarri logo on the seat belt release button clip thingy, and the seat belt is Klippan labeled. All I know is they definitely AREN'T Porsche). The exterior is rough, the rear end is OK, the paint is dull but I think it can shine if I give it a good wax. The front is a little worse, Both fenders have seen body work and repaint (perfect candidate for 944 front fenders eventually) in a similar color. The hood and header panel are rock chipped and peeling. The PO had put a ridiculous hood scoop on it and I had to remove that. -Really crappy wheels with nice falken rubber. Some spacers too. Gonna sell them once I get them off for money towards the car. -A RIDICULOUS obnoxious tachometer (I have literally never seen one this big) that didn't even work. -Stickers for some "racing" thing all over. -And best of all, leaky pretty much straight pipe exhaust which is obnoxiously loud. Otherwise, the car is pretty solid, just incredibly dirty. Clutch feels good, shifts into gear are crisp (stationary, obviously) and there isn't too much play in the shifter. Starts right up after replacing DME relay. Unfortunately the battery isn't out of this car and the hood won't shut with it so I'll have to replace that eventually. I plan on bringing it back to it's glory (on a limited budget however). You can follow my progress over at 924Board where I have a build thread going. PO claims it was a Cali car, it has somewhere between 103k and 143k miles (title and odometer say different things and PO tells me it has more than what the title says but who cares anyways). That's pretty much it, I'm sure I will be writing a part 2 to the 500 Dollar special 924 saga, but that is yet to come. In the meantime here are some more pics. TL;DR: For 500 dollars you can buy a Porsche 924 with a blown brake line and ricer mods.